When I first heard about this new thing called “3-D Printing,” I assumed it was a joke. I mean, I can’t even get my desktop inkjet to work half the time. But since the initial publicity a few months ago, I (and the rest of the world) have been forced to take notice of this entirely viable and amazing new technology. This technology is quite complex, so let’s first start out with some of the basics. Most 3-D printers employ a process called “Extrusion,” in which plastics and other polymers are heated and softened and then cast in layers to make the object designed. Some printers utilize metal alloys and lasers to heat the metal enough to “print” the design. Either way, both begin with the creation of the object. And to do this, one must use one of the computer-aided design programs, or CAD/CAM, that are the bane of every first-year engineering student. However, while these programs may be prevalent in college dorms, they are not quite as popular and widely-used outside of engineering circles, which mean the general public does not have much experience fabricating these items for printing. Because of this current limitation (and others which we will discuss), 3-D printers are not exactly a household product. The high cost of the machines also contributes to the lack of prevalence of this technology. 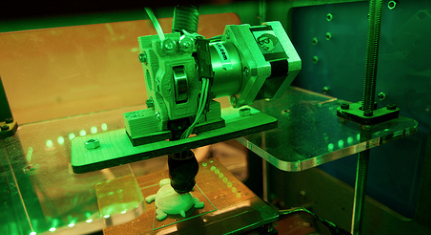 Most quality 3-D printers cost upwards of $2,000, and some even range as high as $5,000. One of the consistently highest-rated and well-received printers is the Cubify Cube-X, which hails itself as “a professional grade 3-D printer at a consumer grade price,” but even so, the base model costs $2,500. And for the average consumer, that seems like a lot of money to spend for a cool toy. While the at-home market may not be particularly strong, 3-D printers are doing quite well in the professional market. They are used to make everything from children’s toys to car parts and dentures, and they are revolutionizing manufacturing industries all over the world. However, with the increasing use and acceptance of 3-D printers in the professional sphere, the consumer market is sure to follow. Even now, more and more people are learning CAD/CAM programs on their own time and are beginning to want fabrications of their work. These programs are beginning to become less frightening for the rest of the general public, as software such as Google Sketch-Up offers an easy-to-use, quality design program as a free download. Also, as the new technology grows, steps have been taken in the creation of the printers, and now there are a few low-cost, quality 3-D printers on the market, with some even as low as $500. The future of 3-D printing is a bright one; recently a fully-functional handgun was “printed,” and while this may lead to further debates over the regulation of this technology, the advances are astounding. And now, even 3-D printed food may be becoming a reality, as NASA has invested in the prototype of a printer which uses nutrients instead of inedible materials as its print medium. Maybe one day we might all be using 3-D printers to make our children a toy and a PB&J, but right now, we might have to be satisfied with viewing the innovations through Reddit posts.